A narrow entrance leads from the Great Swamp west to the Desert of Mystery. 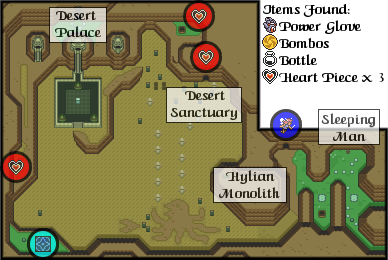 Historians believe that the Desert was the home of the earliest Hylian people, who spoke a language long forgotten. 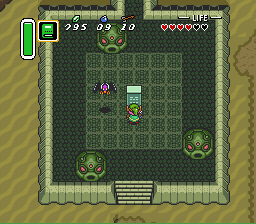 Because you have the Book of Mudora, you will be able to read the script on the Hylian Monoliths that you find there. The desert is a barren region with inhabitants that were made harsh by the extreme heat. Geldmen slither out of the hot sand, and vultures feast on the remains of unfortunate travelers. One never knows what dangers the shifting sands hide, so it's wise to be on the alert at all times. Only the foolish enter the desert without proper provision. On a high bluff east of the desert stands a stone monolith. It is the source of much speculation because the people of the Light World can find no way to scale the bluff to inspect it more closely. Later on, when you are capable of traveling between the Light and Dark Worlds, you will be able to translate the ancient inscription with the Book of Mudora, and discover its message. A solitary old man lives in a cave in the northeastern section of the desert, waiting for the day when Ganon's challenger will come to collect what is rightfully his. The old man guarded one Piece of Heart, and vowed to give it up only to one brave and wise enough to seek him out. He sealed the treasure behind a stone wall for safekeeping. Faeries once lived in special places throughout Hyrule. According to one story, when Ganon stole the beauty from one of the Faeries, the others united and agreed to aid anyone who tried to counter his evil power. They knew that even the strongest and bravest of heroes would face incredible odds because Ganon had the power of the Triforce on his side. The Hylians discovered an oasis of sorts at the entrance to the desert. Inside a cave, there is a cool, soothing spring where a Faerie restores travelers' strength. After hot arduous journey, they were thankful to find the refreshing fountain and returned to it often. Early Hylians erected a palace in the desert that was unlike any other in the land. It has several exits but only one main entrance, which they blocked with huge turtle-like boulders. The upper floors are caves carved out of the mountain, perfect for avoiding the intense midday heat. The cattle skeletons that line the path to the main doors attest to the harshness of the desert, but other, more hardy beasts still roam the sands, menacing travelers who dare to wander into their territory. Historians speculate that this unforgiving desert was once a prairie land used by ancient peoples for grazing their cattle, but the sands of time have taken their toll so that only this wasteland remains. Getting into the Eastern Palace had presented no problem for you, but when you reach the entrance of the Desert Palace, you have your work cut out for you. A giant stone head blocks the steps to the entrance. In the middle of the plaza stands a stone on which ancient Hylian script was carved. You can't understand a word, but the Book of Mudora should be able to help you translate the text. When you use the Book, the sky will suddenly darken, and the stone head will shake as if struck by an earthquake and slide away. The Desert Palace is now open. The room at the entrance of the Desert Palace is so large and sprawling that it take several screens to advance through it all. While it was once elaborately designed and detailed, time has brought so much wind and sand to the palace that some of the walls have crumbled or even shifted, leaving the central hall a largely open labyrinth. You will be greeted by Leevers, little sand burrowing animals. Further inside are wonders like none seen before. A sentry statue prevents visitors from admiring the rich furnishings within. The statues operate by primitive – but effective – radar. They scan the rooms constantly, and when they sense the presence of intruders, they blast them with deadly-accurate beams. The only way to avoid them is to keep moving ahead of or behind the circular scan. For your first destination, you will want to head north and to the west to room 1C. This room only serves as a potentially quick escape route from the Palace. If you rush headlong out of the door, you will end up standing on the tongue of a statue that deposits you back into the desert if you jump off. When you're inside the room, be cautious of the sentry statue that hunts for intruders. At first glance, this room may appear sparse. A sentry statue stands guard in the room, blasting beams at anyone that it feels does not belong. But closer inspection of the torches will reveal a key stuck on top of one torch. If you remember how you obtained the Book of Mudora, a similar trick will work just as nicely in order to claim the Small Key that you need in order to continue. You may hear words of wisdom from Sahasrahla before you leave, if you like, by using the telepathy tile in the back of the room. When you leave and return to the north-west corner of room 1A, head right one door and enter 1D. Two Eyegores occupy this wide room full of torches and jars. Defeating the Eyegores is only necessary if you'd like to make the room easier to deal with. Your true goal is to locate a secret switch on the floor, which is hidden beneath one of the jars. Once you find it, step on it to reveal a treasure chest which contains the Map. When you're done here, your next destination is room 1F, which is locked, but you should have a key to open it. This rooms serves little more purpose than as a trap. When you enter the room, the door will slam shut. Your only means of escape is to destroy every enemy within. This room consist of four red Leevers and one Devil Ant which pops its head out of the ground to shoot fireballs at you. It burrows in and out of the ground and while it's exposed and vulnerable, the shifting sand around it can pull you in close to it where it can attack you. Strike from a safe distance. Destroy it and the Leevers and you are free to continue on your way. You'll enter a room with three Popos and a sentry statue. Take out the Popos while doing your best to avoid the attention of the statue. Open the treasure chest that you encounter at the top of the room to discover the Compass. Head north and enter the room above. In this long stretch of a room, you will encounter cannons mounted on tracks along the walls. They shoot cannonballs across the room, and you will have to make your way from one side of the room, between the crossfire. You will be well-rewarded for your bravery when you open the treasure chest and discover the Big Key. With the Big Key in hand, make your way back to the giant room 1A. Now you need to cross back over to the other side, and approach room 1H. After you enter the room, you will be locked in with a sentry statue and a circle of pottery. Be patient and take your time destroying the pottery so as not to step in the line of vision of the statue. There's actually quite a lot of goodies hidden in these jars, but you are ultimately looking for the jar that conceals the trigger which opens the doors, located under the north-west pot. Step on it so that you can advance to the room above. The large treasure chest is practically begging you to open it. Thanks to the Big Key, you can. Run up to it and examine its contents to obtain the Power Glove. With this amazing item, you gain the strength to lift boulders, large and small. 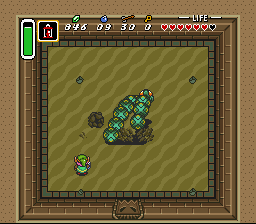 Be aware, however that there are two different types of rock commonly found through Hyrule. The one darker in appearance are far more dense and weigh many times that of the lighter ones, and your increased strength is limited to these light rocks. With your new found ability, you will wish to return to the room below, activate the trigger again, and return to room 1A. Now simply head south the last portion of the room remaining to be visited. As with the portion of the room before it, there are a number of Devil Ants and a few different Leevers. You aren't required to fight any of them, but it's a good idea to clear any enemies that get in your way. You're aiming for the lowest left-hand door. A lone sentry statue stands guard in this alternate entrance to the Palace. There is a locked door up above, and it can only be opened by resourceful adventurers. The key to accessing the room above is to push a certain block that will trigger the door's release. Push the right block up, and you can examine the contents beyond. Otherwise, head out of the door and back into the desert. This room serves as a bonus for resourceful adventurers who are in need of healing, or perhaps wish to resupply their empty bottles with these invaluable second-chance providing fairies. Don't miss out on this easy opportunity to regain your strength. When you exit from room 1K, you will find yourself high up on the cliffs. A little examination of the area will reveal a set of light boulders blocking the entrance to the remainder of the Palace. If you've found the Power Glove, these boulders will no longer pose a problem for you, as you can simply lift them out of the ground, and even throw them at enemies as weapons. However, if you explore the area diligently enough before you enter the next section of the palace, you will find a Piece of Heart sitting right out in the open for you to collect. Interestingly, this room looks rather similar to the room you just left, 1K. Only there is only one other exit, and it's slammed shut. The sentry statue is unaffected by anything that you do, so you need to find another method to open the door. Two sets of blocks occupy the top of the room, and one of them can be manipulated if you push on it. Pushing the correct block, the lower in the right-hand set of three, will cause the door to open, allowing you to advance. What initially appears to be an empty room is actually a dangerous trap. Tiles will begin to lift off the ground and careen through the air, flying right at your head. A few well timed swipes with your sword can protect you from harm, but hold still and remain facing the onslaught until the tiles cease their attack. 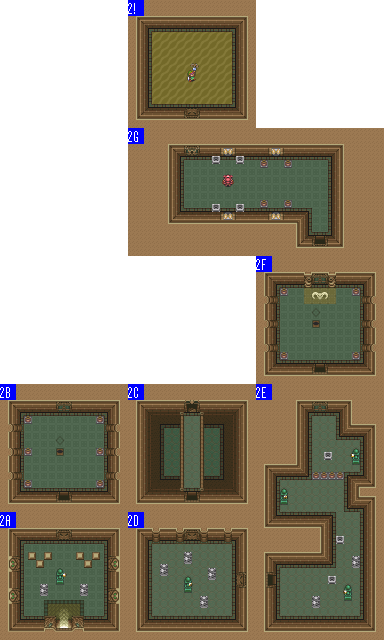 A simple solution to these rooms is to remain standing in the doorway and watch as the tiles smash into the door frame one after the other allowing you to defeat the tiles untouched and without swinging your sword even once. The remaining pattern on the floor appears, not so ironically, like a skull. Once calm is restored, investigate the jars to discover a Small Key under the bottom-left urn. Use it on the door above. An eventful room; cross the bridge to enter the door on the bottom. When you enter the room, the door will slam shut, locking you in there with a sentry statue and four Popos. You must defeat every one of them in order to open the doors again and advance to the next room. You may discover, in the course of fighting, that you are protected from the statue's beams if you happened to be positioned behind the statues scattered about the room. Use this to your advantage as you eliminate the Popos. Once the doors are open, head right. This long and slightly winding room is quite dangerous, with not two, but three sentry statues situated about, and five Popos wandering around. 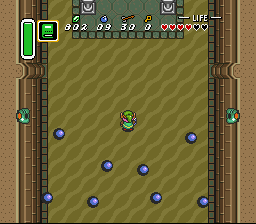 While you avoid the statue beams, and defeat the Popos, you must ultimately examine the pottery lined up near the top of the room. Destroying them will reveal a Small Key hidden inside one of them, which is needed to open the locked door above. You've opened one locked door only to discover another, this time with the boss mosaic printed on the tiles. You are getting close to the Palace Guardian. But before you can approach the door, you will be set upon by another group of spinning tiles. Defeat them all, and repeat the act of searching the pottery for the jar that contains a Small Key. Use it on the door above. A red Eyegore is waiting for anyone foolish enough to proceed so deeply into the Palace. From your experience in the Eastern Palace, you might remember that the only way to defeat him is by firing arrows into his gigantic eye. Take him out of the picture before examining the rest of the room. Now you will encounter something strange. There appears to be no further exit from the room. There aren't even any triggers found underneath the four jars, and four torches simply rest along a dead-end. 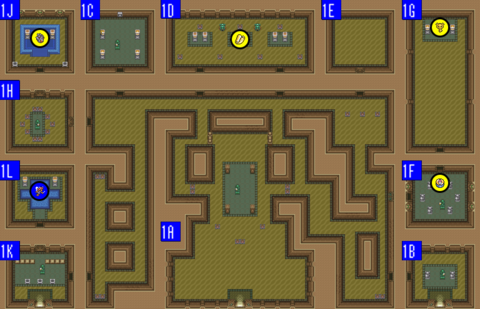 The Map shows that the Palace Guardian lies behind the wall, but there doesn't appear to be any way to reach him. Turn your attention to the four unlit torches in the room. Using your lamp, light all four torches even though the room is already well illuminated. If you can succeed in getting all four lit simultaneously, watch in amazement as the left wall slides away, revealing the door which leads to the Guardian. The Lanmolas are actually three different sand burrowing worms. When they sense a disturbance on the surface of the floor, they rise out of the sand and sail through the air in an effort to attack the intruder before landing back down into the sand and burrowing underneath for a while. Their bodies are covered by a hard exoskeleton, but their head is far more vulnerable to your attack. You will have a brief moment's notice where they are popping out of the ground before they appear to attack. When they pop out of the ground, four clods of dirt scatter diagonally, which can hurt you (and this increases to 8 pieces in 8 directions when only one Lanmola remains). At that time, it's a good idea to have your sword charged for a spin attack. Stand alongside the shifting dirt where they are about to appear, and release your attack when you see their head. Another strategy is to quickly place bombs on top of the shifting dirt. If this is timed right the explosion will hit the head as it emerges from the ground allowing you to keep a healthy distance. After a number of attacks on the head of each Lanmola, they will disappear. When the last one is defeated, you will be rewarded with a Heart Container. Collect it and you will receive the Pendant of Power, along with a quick warp to the entrance of the Desert Palace. According to the marks that Sahasrahla left for you on your map, the last pendant, the Pendant of Wisdom, is found high up on Death Mountain. Now that you possess the strength of the Power Glove, you can access its daunting caves and scale its heights. However, there are a few important and useful items that you can pick up before you approach the mountain. Explore Lake Hylia and some of the regions above the Eastern Palace to vastly increase your traveling abilities. This page was last edited on 29 April 2014, at 19:38. This page has been accessed 144,929 times.